Campsite The Apple Farm Kl.A is a campsite with 32 touring pitches. During low season, between 01-05-2019 - 02-06-2019 and 01-09-2019 - 30-09-2019, the nightly rate is €14,- at one of the 32 touring pitches at Campsite The Apple Farm Kl.A in Caher (Munster). At this campsite you can not only use your CampingCard ACSI for inexpensive camping, you can also use your ACSI Club ID (as an alternative ID). A small, atmospheric campsite located in a fruit orchard. Sample the apple juice and enjoy a relaxing walk among the fruit trees. Apple juice, jam and cider are on sale in the shop. Ideal for day trips. Free use of the tennis courts. Drinking water from own source. Plenty of space for play but did not notice specific child facilities. Lots of wild rabbits to watch on site. The Historic buildings and forest walks nearby make this one of my favourite sites. Of course we took home a case of Apple juice and a box of apples from the farm shop. We will be back again for more! Lovely site, relaxing, friendly, clean and a great location for a base for touring the region. Excellent variety of fruit in summer. Child friendly, especially for young children. A quiet site on a working apple and soft fruit farm. No dogs. Free hot showers. Free WiFi inside a huge common room (shared with the farm workers). Farm shop selling juices, jams etc, with a gift bottle of apple juice on arrival. We'll be back! 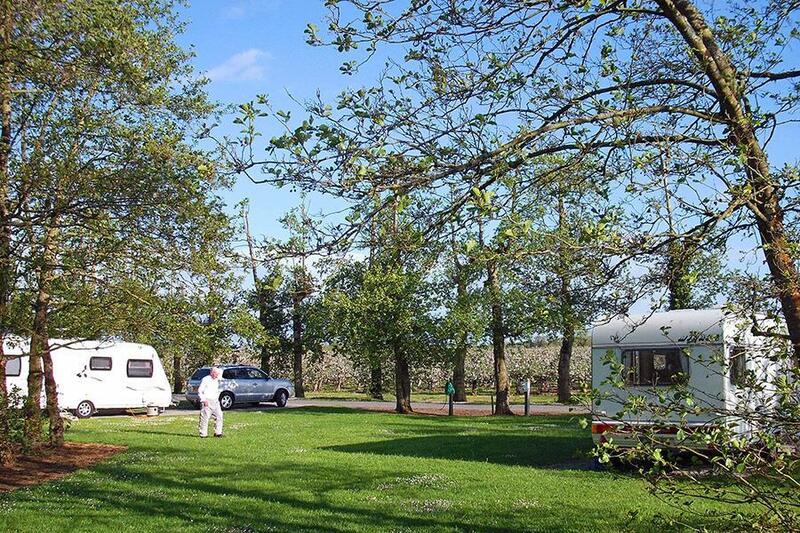 Would you like to book Campsite The Apple Farm Kl.A or request more information? You can do both using the information below or by visiting the campsite's website. The campsite is along the N24 Cahir-Clonmel, 6 km from Cahir. CampingCard ACSI will send your information request to "Campsite The Apple Farm Kl.A".